Form 16B is required in those cases where you bought an immovable property for a consideration in excess of Rs. 50 lakhs and you have deducted TDS @1% while making payment to the vendor. For deducting TDS from your payments you are required to issue certificate in Form 16B to the person from whose payment TDS has been deducted. Form 16B has to be downloaded from trace portal maintained by IT department. However, you will not be able to download form 16B if after deducting TDS from the payments you have not submitted form 26QB to tax department. After making payment of the deducted TDS amount through Challan 26QB, you can see it in your form 26AS reflecting with break up for each amount paid and acknowledgement number for that. Form 16B can be downloaded in two steps. First you need to register yourself as a tax payer and then through your tax payer login you will be able to download it. For downloading form 16B you have to register yourself as a tax payer not as a deductor. You can download form 16B after logging in as a tax payer. To register yourself as a tax payer you can visit trace portal. Here are the steps to register you as a tax payer. 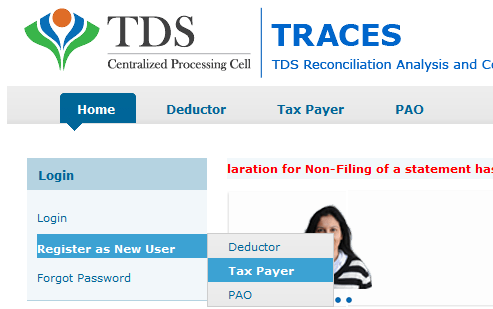 From the right hand side of the traces portal select Register as a New User > Tax Payer as shown below. Fill up all your details like pan number, DOB or DOI, name etc. 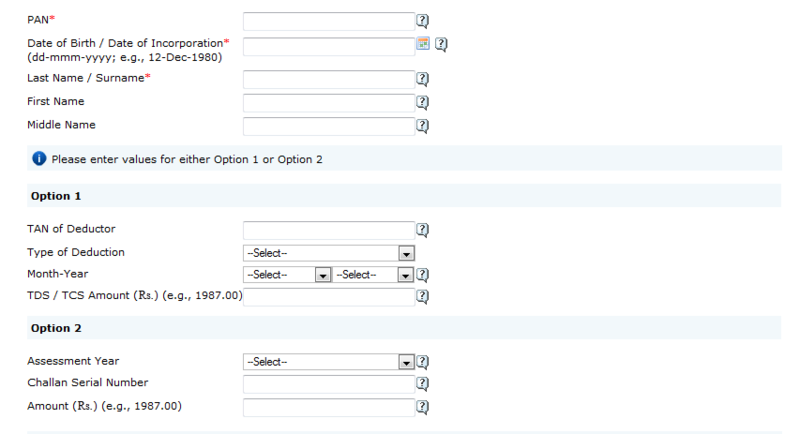 With this you have to fill up either option 1 or option 2 to get registered. If you as a taxpayer have paid TDS and filled 26QB then try option 2 with your latest Challan details and TDS amount paid through that Challan as we found that option little easier compare to option 1. After filling up the text, click on proceed. Then you will be displayed with an option to enter your details like mobile number, address, email ID and then password. By default your PAN will be the user ID for logging in as a taxpayer. After this step you will be sent with a PIN to the mobile number that you entered while registering and a link to your email id for activation. To activate your account you need to click on that link from your email id and enter the activation code to activate. Now, login to your account as a taxpayer as discussed at the beginning and from the download section click on form 16B. You need to enter your details like acknowledgement number to send the request for downloading form 16B. After sometime you can check this section for downloading form 16B. Click on download to save it to your PC. Now you have your Form 16B which you can be signed and sent to the seller.